Breakfast is my favorite. Most days I don't work until 9ish, "ish" being a cushion of about twenty minutes because in Italy no one is on time ever, ever. It's great. I drink my coffee slowly, read blogs and emails, respond to comments, plan the day, do some stretches, eat oatmeal. 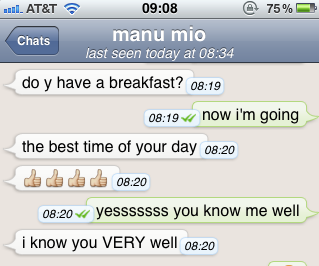 Look, even Manu knows how much I love it. Can we discuss how much his English is improving? I just hope he doesn't ever stop saying things like, "do y have a breakfast". Because that would just be sad. Bring the water or milk just to a boil. Turn the heat to medium and add the oats and salt. Cook uncovered for 25-35 minutes stirring every now and then until the oats have absorbed most of the liquid. In the meantime, mash the banana with a fork in a bowl. Add the brown sugar, vanilla, cinnamon and walnuts. Pour in the oats and stir well. *If you like your oats to be looser, you can add more milk at the end. Bananas and walnuts were meant to be together. Like me and breakfast, really.